We’re celebrating an amazing 20 years of exhibiting at the NEC caravan, camping and motorhome shows in 2019. We’ve delved into the Caravan Guard archives to bring you a photo montage of 20 showstopping years promoting our caravan, campervan, motorhome and trailer tent insurance. Since 1999, our presence at the shows has grown and we’re now a regular feature in hall one at the February show and hall 19 in October – talking to visitors about insuring their pride and joy. Over the years we’ve had lots of different games for show visitors, from roll-the-dice; to win a Lego campervan; play your cards right; crack the safe; and more recently our popular “wheel of fortune”. 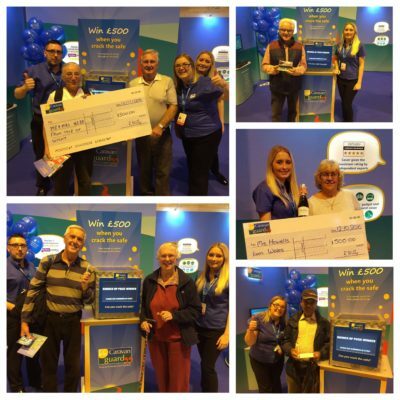 We’ve given away thousands of pounds, years of free caravan and motorhome insurance, plus many prizes, such as key protectors, multi-tools, frisbees, ice scrapers, keyring torches, USB chargers, pens, water bottles, playing cards, first aid kits, balloons and lollies. 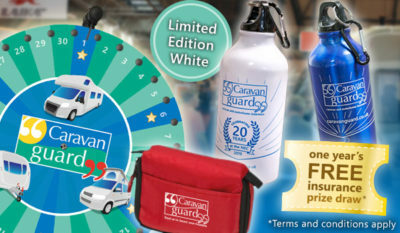 And to mark our 20th year anniversary – for 2019 only – we have a limited edition white water bottle, as well as our trusty blue bottle and first aid kit. There’s a limited number of white bottles available, so once they’re gone they’re gone! As always, our team of motorhome, campervan, trailer tent and caravan insurance experts were on hand to talk to you about insuring your leisure vehicle and visitors to our stand can spin our wheel for a one-in-five chance to win one of our great prizes. The show runs from February 19th to 24th, at the NEC in Birmingham, and as well as a plethora of accessories and leisure vehicles, there are lots of activities, talks and demos to help you plan your next adventure. 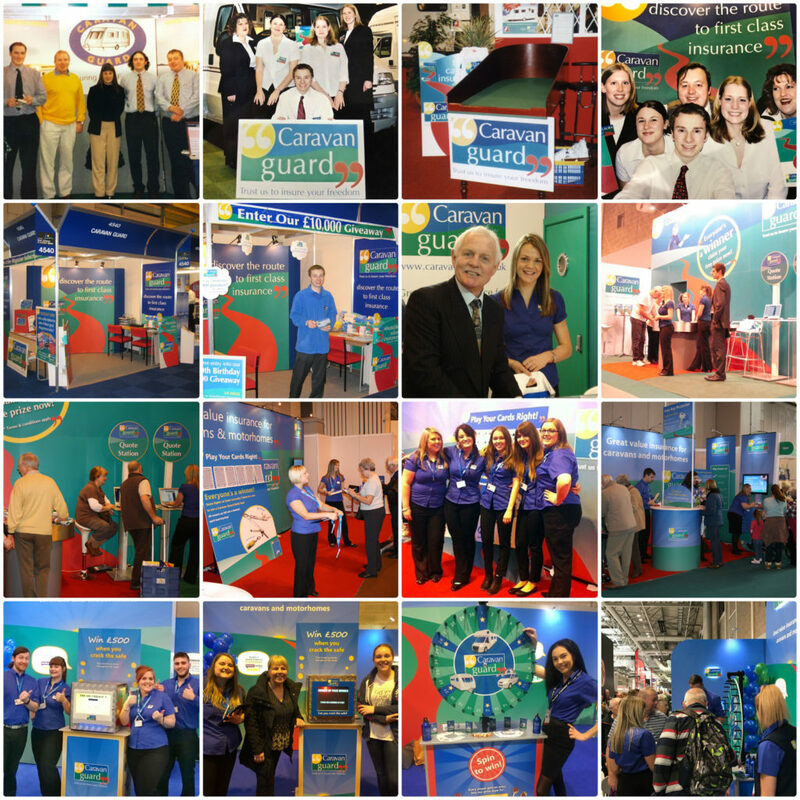 Find out what we’re up to at the show by following us on Twitter or liking our Facebook page. We’ll also be bringing you some video highlights on our YouTube channel. For more information about the show visit www.ccmshow.co.uk. *20% touring caravan insurance discount includes 10% new policy discount plus Caravan Guard’s ‘club’ discount. Club discount can only be claimed once per policy term. 20% off and the £10 off motorhome insurance are available on new policies only and are not available in conjunction with other offers. Minimum premiums apply. Free insurance winner will be drawn at random and notified after the show.